SIC RS SCC – SUP, Windsurfing UK. 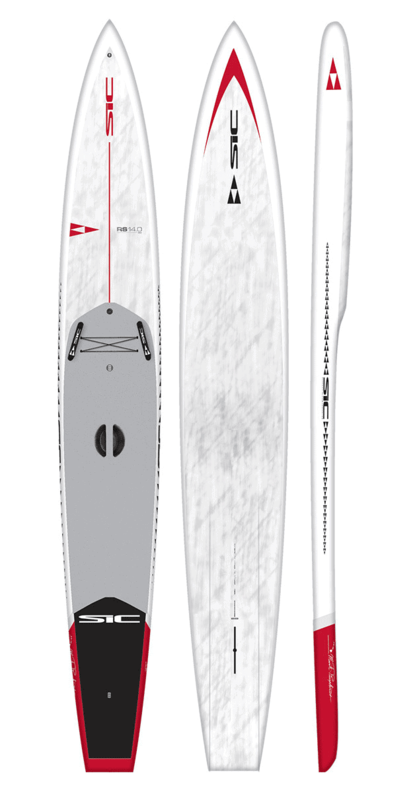 The need for raceboards that are specialists in flat water or open water is diminishing as new shapes like the SIC RS , Jimmy Lewis Sidewinder, Starboard AllStar and Infinity Blackfish morph into something that can do it all really well. The SIC RS 14’0 x 26” is a really interesting board for us as it encompasses so many real reasons to have a one board quiver, but do make sure as with all this kit you look after it. It is one of the lightest performance boards that we’ve tried at our centre due to the SCC (single carbon construction). Compared to the old way SIC made the Bullet, the SIC RS uses Innegra in the rails which is much like a reinforcement strip giving added strength to an area that was previously vulnerable. In all conditions the board feels exceptionally rigid so effort you’re putting in is being directly outputted. The board is stable and works well on the water being able to adapt to the prevailing conditions. The nose area is subtle in shape but works well in peeling the water apart and creating a path of lesser resistance whilst delivering a helping hand in downwind conditions. SIC were so convinced with their new board that they named it the Rocket Ship, hence RS and it is certainly proving to be that. Something that brands like Jimmy Lewis, Infinity and SIC are very good at is developing prototypes and working on the fine tuning. 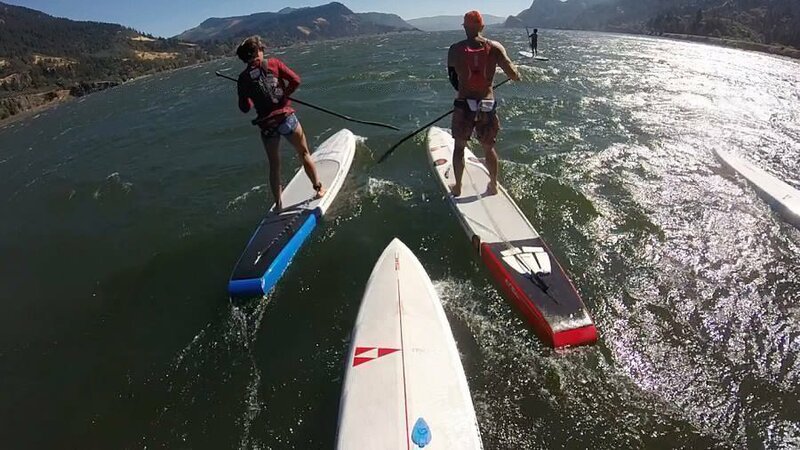 With the SIC RS, the shapes were developed and tested at venues like the Pacific Paddle Games so real world testing was applied. After all of the initial tests were done the final specs made it back to the body shop where changes were made and the final test shapes were put put to the racers who then went out again to go up against other brands in the technical, long distance, sprints and downwind races. I think it really is convincing when your boards are coming back ahead of the game in races like the Olukai, Carolina Cup and Euro Tour. Yes, it is being powered by an elite paddler, but so are the other boards. It’s not a board you’d buy for touring as it’s simply too expensive, but if you love to challenge yourself out on the sea or simply love the idea of fast then the SIC RS has a place in your quiver. The boards size range comes as: 12.6 (23.5, 25.0, 270,) // 4 widths in the 14.0 (23, 24.5, 26.0, 28.0). As with all things SIC, board performance for its preferred discipline is definitely right up there and we pitted it against the Jimmy Lewis Sidewinder II that’s been released for Winter 2017. Both boards feel super stable for their widths with the Sidewinder using a 29, 27, 25, 23 width configuration. The RS is lighter due to the single carbon layup, but this does mean it’s more vulnerable compared to the Jimmy Lewis board with it’s sandwich pvc layup. Performance was very good in both boards, especially in rougher seas and on a downwind run they were both easy to catch and maintain bump runs and control.